Work has been completed at the new Drumpark and Greenhill Primary School on the site of the old Coatbridge High School. The development forms part of North Lanarkshire Councils Schools and Centres 21 Framework. CRGP Ltd provided Architectural and Building Surveying services to the Framework Contractor Graham on the £12.5M development. 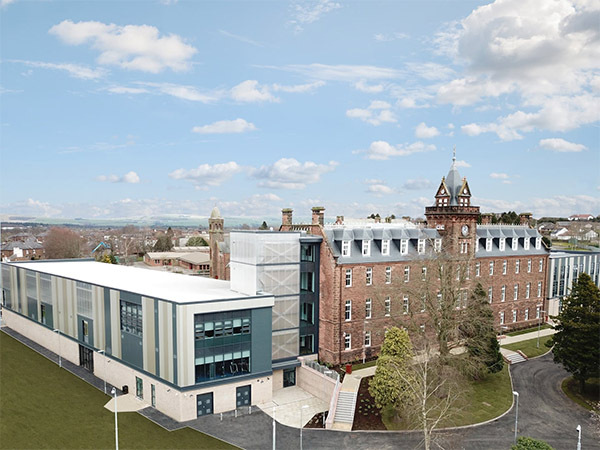 The project involved the sensitive refurbishment and extension of a Grade ‘C’ listed building to create a new joint campus for Drumpark ASN Primary and Greenhill Primary schools. The sustainable solution to the project brief was to remove the dilapidated 1960’s extensions and return the listed building to prominence. Three contemporary interventions were inserted in to the site to compliment and enhance the existing spaces; a large glazed courtyard with an ETFE roof, a polycarbonate light box and a Trespa clad extension. The existing spaces within the building were then re-ordered and refurbished to create modern Teaching spaces, each with adjoining Activity breakout areas. It was important to retain and enhance the benefits of the Victorian design such as the extensive natural day lighting from the large areas of glazing. The existing features within the building such as the ornate plaster cornice and glazed atrium rooflight were also retained. The roof was completely overhauled to meet current standards with existing slates re-used on the main elevations. The combination of modern insertions and upgrading/stabilisation works have ensured the long term viability of the building. CRGP Ltd and Graham have also worked together on the new Calderbridge Primary School which was completed in April 2012 and the recently completed Coltness High School. Both projects were part of the North Lanarkshire Council Framework.